On Saturday, July 9, the City Hall of Rio inaugurated the Transolímpica, a Bus Rapid Transit Expressway built over the past three years, at the expense of hundreds of evicted families, to connect two of the main Olympic venues – the Vila Militar in Deodoro, and the Olympic Park and Athletes’ Village in the newly developed region the real estate market has dubbed “Barra Olímpica”. Five days later and despite the light traffic in its early days, when it was only open for tests and training of BRT drivers, on July 14, major cracks broke out in one of the Transolimpica’s main overpasses. Just a few weeks before, the VLT, or Veiculo Leve sobre Trilhos, a slow-moving tram connecting the port and central city bus station to the Santos Dumont Airport downtown, had stopped short in track in its first day of operation due to an electric malfunction. The incident with the VLT, illustrated by photographs of travellers on their way to the airport hauling their luggage to the beautifully located downtown airport by foot seemed comically quaint in the aftermath of the partial collapse of an elevated cycle path on April 21. This accident occurred when a massive wave swept away a 50-yard slab of the ciclovia Tim Maia, a cycle path partially inaugurated just four months earlier, in January. It left two people dead. In Portuguese, the term that designates the type of massive waves and high tide that hit the shore of Rio’s beaches on that Thursday afternoon is ressaca, the same expression used for hangover. Ironically, just hours before the accident, Rio’s major Eduardo Paes was in Athens attending the ceremonial lighting of the Olympic flame. The accident also occurred four days after President Rousseff’s impeachment vote in the House of Representatives brought to a new level an ongoing, slowly wrought out coup d’état. As social analysts and critics of the Olympic project then noted, the ruined ciclovia symbolically translated the general sense of a collective hangover preceding the Olympic spectacle, just as it cast doubt over the material conditions for holding the Summer Games in the city. Each and every one of these incidents (the unfinished athletes’ Village, the cracks in the brand new expressway, the malfunctioning VLT, and the collapsed cycle path) make Brazilian songwriter Caetano Veloso’s line “here everything seems still to be under construction and yet is already ruin”, borrowed from anthropologist Claude Levi-Strauss’ description of São Paulo in Tristes Tropiques, ring uncannily true. This line figures as a rich motif from which to read Rio’s Olympic ruins. Two types of ruin are usually related to Olympic games or large urban development projects: the first refers to the ruins of the city before the Olympics, and they take the shape of demolitions, that in turn usually entail evictions. These are the ruins of “creative destruction” that draw attention to the sudden erasure of recent pasts, and they lend themselves both to nostalgic and critical discourses. These ruins come before the Games, and their remains are to be erased by the Games, in exchange for the promise of “legacies” that vary from city to city. Quantitatively, in comparison to other Olympic venues, the scale of Rio’s removals pales next to the reported 1.5 million evictions unleashed by the Beijing Olympics, or the 48 thousand buildings razed in the process leading up to the 1988 Seoul Olympics, affecting 15% of the population. Nevertheless, the estimated 77,206 people displaced between 2009 and 2015, according to the city’s official sources, faced countless human rights violations, as the Comitê Popular da Copa e das Olímpiadas, Amnesty International, Justiça Global and other community based movements and non-mainstream media have diligently documented. 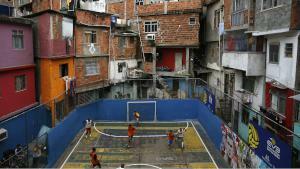 In the process of building the so-called Olympic city, investments in favela infrastructural upgrading schemes have been sharply cut back, while the “relocation” machine got hardwired into city politics and policies with the incorporation of social housing units constructed by the “Minha Casa, Minha Vida” federal social housing program (literally, “My House, My Life”) as standard compensation for evicted families. Rio’s ruins, however, became evident even before the Summer Games. There is another type of ruin produced by the Olympic Games, one that makes them into an established aesthetic motif: abandoned Olympic stadiums, swimming pools, podiums and former Athletes’ villages draw photographers and artists across the globe and have yielded many books and exhibits (for instance, Olympic City Project and Mark Byrnes’s “Beijing Olympic Ruins”). These “white elephant”-type ruins relate to a certain predilection or sensibility attached to architectural ruins in general (old shopping malls, amusement parks and industrial facilities) that get rendered into hauntingly beautiful images. Here ruination itself is a process that requires time and abandonment to unfold. In both cases, the Games act like a watershed, that institutes a before and after for the city hosting them; ruins are either erased before the Olympics, or ruination begins after the Games. Rio’s ruins, however, became evident even before the Summer Games. In 2009, when Paes took office and the winning bid for the Olympics was announced, the general optimism stemming from economic prosperity, years of declining inequality rates, soaring oil revenues, booming real estate markets, and a great deal of city marketing drew a picture of redemption from a decades-long spiral of social decline, urban decay and rising crime rates. The optimism was considerably reinforced by the initial success of the Pacifying Police Units Program. 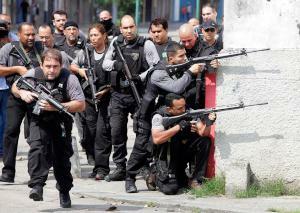 Launched in late 2008, the program consisted in the permanent occupation of certain favelas by recent recruits; its manifest objective was to do away with the weapons and armed conflicts that constituted one of the key obstacles to constructing a veritable image of a city hosted to suit global events like the 2014 Soccer World Cup and the 2016 Summer Games. And yet changes were more conjunctural than structural, insofar as the moment of prosperity rested largely on the mirages of city branding and on a good deal of wishful thinking, as the ensuing crisis would make evident. By 2015, the context in which the Olympic bid had been announced had dissipated, and expectations were completely reversed: economic recession, corruption scandals, constant shootouts in the favelas, and the state of Rio’s unprecedented debt and institutional breakdown that followed the plummeting of oil prices on the global market engulfed the images of a city gloriously rising out of a long process of decadence and decay. Firstly, the “Morar Carioca” program, an extremely ambitious endeavor whose mission was to urbanize all of the city’s favelas by 2020 was radically downsized when its main contracts got cancelled in early 2013. Upon its launch, in mid 2010, the program had been announced as the greatest legacy of the 2016 Summer Games; it drew on the practices and institutional structures decanted by decades of infrastructural upgrading works undertaken by the city Housing Department in the favelas. No other infrastructural upgrading program replaced it. 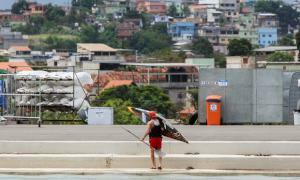 Meanwhile, as the federally funded Programa de Aceleração do Crescimentohas stalled in its second phase, investments in favela infrastructure across the city have dwindled. Negotiating compensations and “relocation” of residents has become the main attribution of the city’s housing department, that for the previous twenty-two years had centered its activities on favela infrastructural upgrading programs. Lucas Fullhaber’s map of Olympics related removals shows that one of the features of the production of the so-called Olympic city is the flow of families removed from centrally located favelas to social housing condominiums located further out in the periphery. Yet ironically, many of the “Minha Casa, Minha Vida” housing units seem to suffer from the same curse as theOlympic ruins, insofar as their material deterioration also seems to begin as soon as tenants move in. This is not really surprising, given that the condominiums are built by the same contractors as Olympics related infrastructures (which is not surprising, given that the program was conceived as a countercyclical measure to help the construction industry get through the 2008 economic crisis). In the meantime, the UPP Program shows unequivocal signs of its undoing, first with mounting reports of continuing police violence and corruption, then with the gradual return of armed conflicts in the favelas. 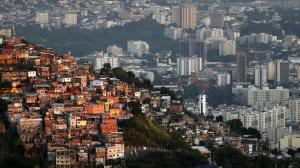 To favela residents, this comes as no surprise. Back in 2011, when I conducted field research for an evaluation of the UPP Program, residents were already skeptical of its future, and pondered quite candidly that it would only last up until the Olympics. It turns out this was an optimistic estimate. The Olympics were also supposed to provide the vital push to the cleaning up of Guanabara Bay and of the Jacarepaguá Lagoon, but as early as 2015 the city and state governments had already admitted it would take an additional 20 billion reais and twenty years to achieve the regular treatment of 80% of the sewage dumped in the Bay pledged back in the original candidacy. The cycle of fast development in the areas surrounding the Olympic park suffers the same infrastructural deficiencies as the rest of the west zone of the city. The Olympic city is therefore bound to dump more sewage into the already polluted and congested Guanabara Bay. The subway system is operating according to a contingency plan that leaves at least one station unfinished, to be delivered only in 2018. More than 10 billion Brazilian reals have been invested in the expansion of the subway system, but given the unprecedented budgetary crisis the state of Rio de Janeiro is undergoing, there is serious doubt as to when – or whether – the Gavea station is to be concluded. “White elephants” in the making? 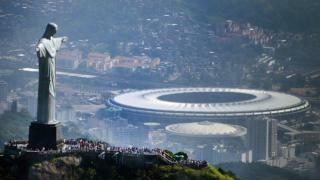 The “morning after” the Games, “white elephant” types of Olympic ruins will begin to emerge. While this process is bound to repeat itself throughout different areas of the city, by way of conclusion I sketch a few remarks on the areas surrounding the Olympic Park and the Athletes’ Village, where I have conducted and coordinated ethnographic research since 2011. The fate of the development front on the shore of the Jacarepaguá Lagoon, facing the Olympic Park is uncertain given the current crises. The Ilha Pura condo – as the private market version of the Athletes’ Village is known – has not sold nearly as well as its luxurious public launch and upmarket public relations campaign suggested it would. In late 2015, less than half its units had been taken, and of course its market appeal has declined following the fiasco of its inauguration. Its failure echoes that of the Athletes’ Village of the 2007 Pan American Games, that began to crack as it sunk into the marshy land it was built upon. Ilha Pura’s stagnation, in turn, raises questions regarding the feasibility of the housing development and public spaces that are to be constructed in the Olympic Park grounds after the Games; it also begs the question of the future of the permanent structures built there. In the corporate and shopping enclaves along the waterfront of the Jacarepaguá Lagoon, new shining office and commercial buildings already seem overblown, and emptied out. Further inland, along the Estrada dos Bandeirantes, ongoing construction work on some of the lower middle class condos that had seized the Olympic real estate boom has also stalled; their unfinished structures loom over the debris and dust of the neighboring ongoing construction. Just as uncertain but much less visible is the future of the workers involved in the material construction of the Olympic Park, the Athletes’ Village and myriad other smaller scale enterprises set in motion by the sudden valuation of the area. The favelas of the region, that over the past years have experienced an exponential increase in the number of households, fed by the proliferation of quitinetes, or one room apartments, kept the real estate market in the favelas in the vicinity of the Barra da Tijuca Olympic cluster booming over the past seven years. Business within the favelas also prospered with ongoing construction work – in all the sites around but also within the favelas, in the very construction of “quitinetes”. In all the favelas of the region new restaurants specializing in serving pratos feitos, a standard workers lunch, bustled at noon with employees bearing badges of dozens of specialized service providing firms involved in the construction of housing, roads, and the Olympic facilities. As the Olympic trigger of development is extinguished, not only this entire landscape but also other areas of the city are to deal with the debris of the past cycle of urban planning. Next week, when the Games are over and the flow of tourists begins to dissipate, the city will awaken to consequences of nearly a decade of Olympics-centered city planning and politics run by shady PPPs (Public Private Partnerships) and operated by contractors involved in multiple corruption schemes. Less than two months away from the October municipal elections, the city’s fate is also inextricably tied to the state of Rio’s unprecedented economic crisis and to President Rousseff’s upcoming final impeachment judgment. In this uncertain context, speculations on what is to become of the Olympic city-making process are futile. But the coming administration will have to deal with the aftermath of unfinished, postponed or already crumbling Olympics-related development. This piece develops ideas initially published in the chapter “Futures and Ruins of an Olympic City”, written with Julia O’Donnell and Lilian Sampaio, that is forthcoming in Occupy All Streets: Olympic urbanism and contested futures in Rio de Janeiro. An expanded version of this story was originally published on the UK OpenDemocracy site, available here. It is republished under a Creative Commons Attribution-NonCommercial 4.0 International licence. Corporations bring the “pop up for our profit” mentality with them. Look at what happened in Beijing, many families were thrown from their homes, their homes demolished just for the stupid corporate hunger game style Olympics. And people still sit, watch and support this?